We have written on several occasions that Napa’s road less travelled, Silverado Trail, is home to many of the best wineries in the valley. That same thinking may apply while tasting in the Downtown Napa area. Tourists flock to Oxbow and First Street; both areas are full of tasting rooms. Stonehedge Winery Tasting Room sits a couple of blocks from First Street, away from most of the foot traffic, on Clinton Street. 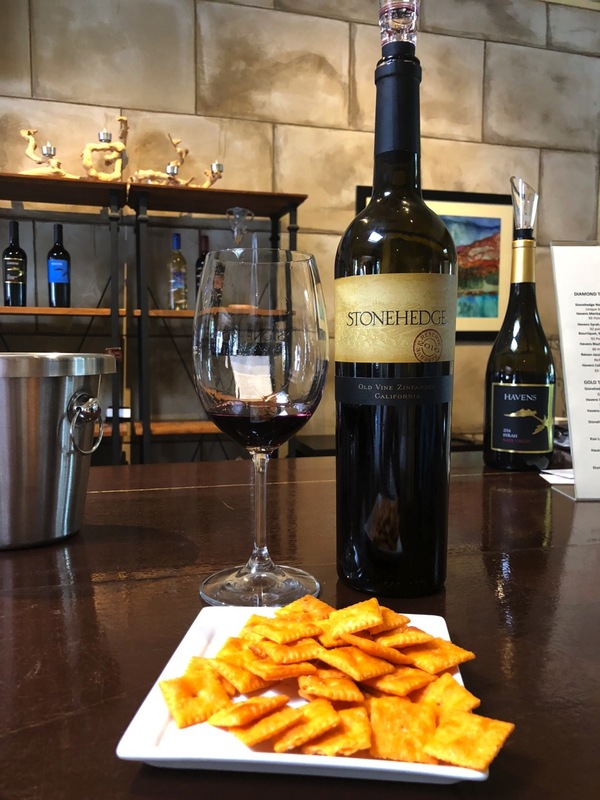 After my recent experience at Stonehedge, I can assure you that it is worth walking those few hundred yards to try their wines. Amber was attending a conference at the River Terrace Inn in Napa. 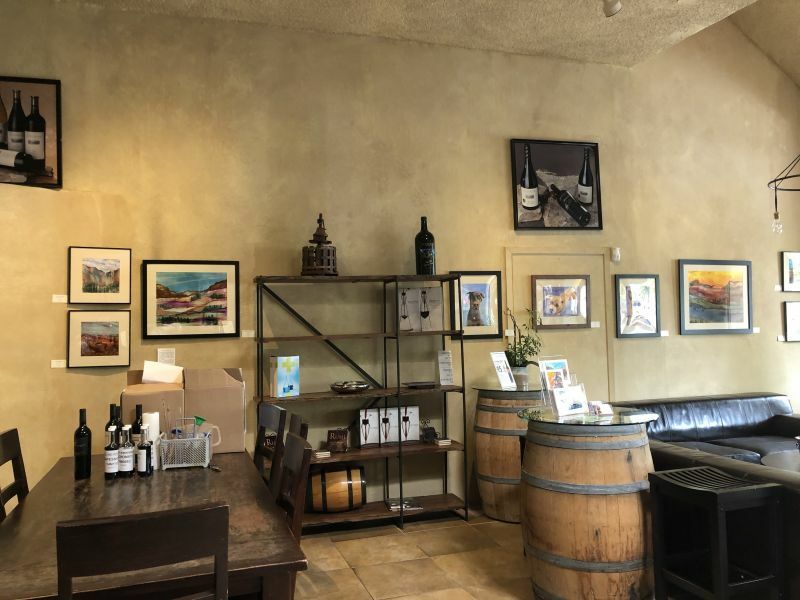 I came with her on the Sunday on which the conference began, with a plan to try a few of Napa’s downtown tasting rooms without having to drive the 15 minutes back home. Thankfully, I was not the only plus one at the conference, and I was joined by Gary, the spouse of Rick from the Strong Coffee to Red Wine blog. We had no specific tasting room in mind, but I was planning to head to First Street, as I knew that would offer us many options. 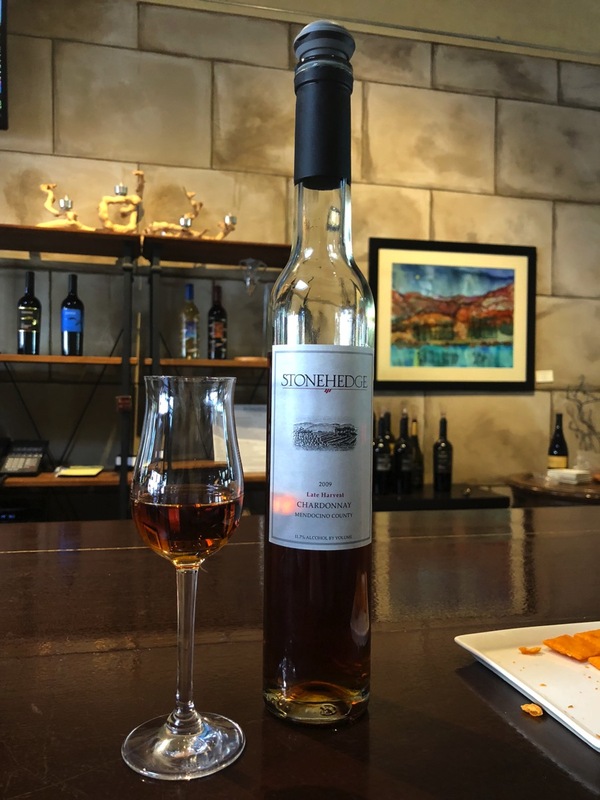 Amber Comments: So basically the guys left us doing all of the hard work as we studied wines from all over Napa while they went off to do a wine crawl around the Downtown Napa area. Do you see how that works? Nice huh? We strolled down Vallejo Street to Main Street before heading towards First Street. We saw the Vintner’s Collective on the corner of Main and Clinton, but that place was packed, which made it less than ideal for us to taste, make notes, photo, and talk with the host. Fortunately, it was then that we saw Stonehedge which was quieter, so we made the decision to give it a try. 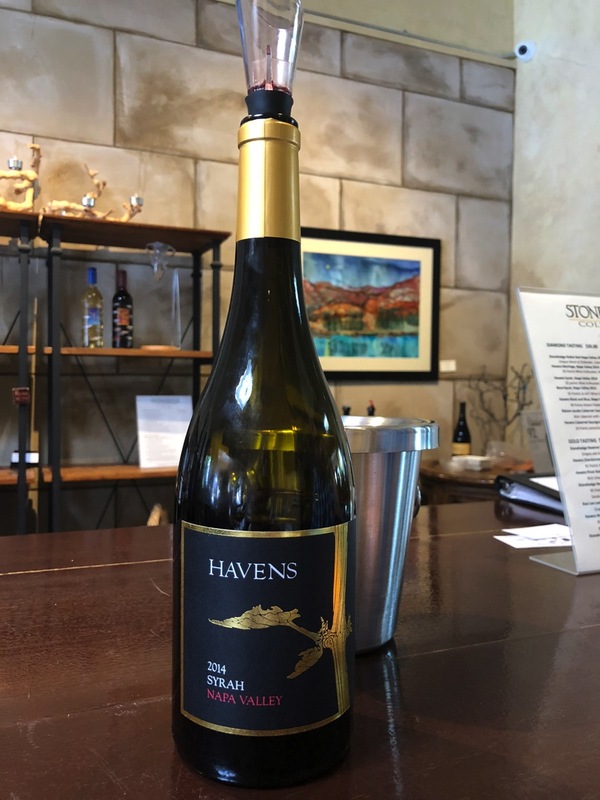 We started our tasting with the 2015 Havens Chardonnay, which had spent twelve months in a mixture of French and American oak barrels. This wine is priced at $48 a bottle. The nose was of tropical fruit and vanilla. I tasted oak and pineapple; a little too much of the former. Whilst it was not a mouth full of oak, there was a little too much wood for my taste. 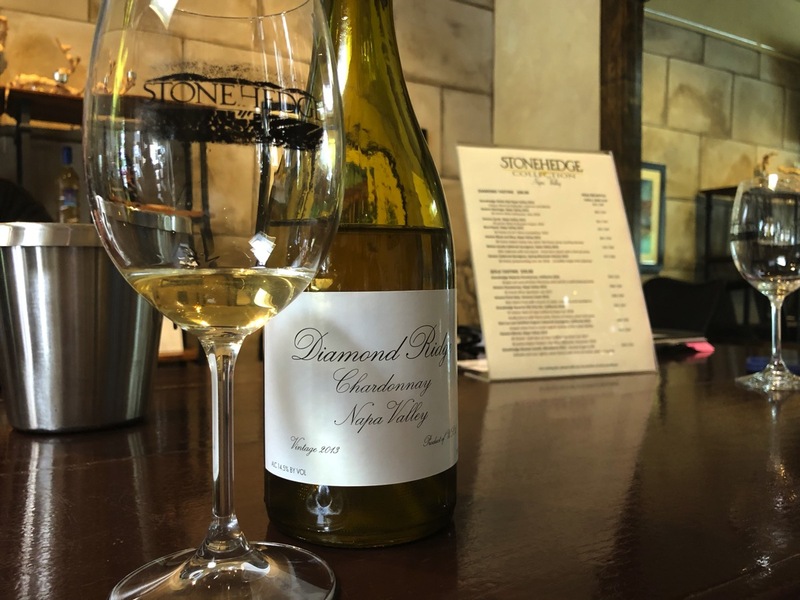 Our host, Pam, responded to my lack of enthusiasm with this opening wine by reaching for another Chardonnay; the 2013 Diamond Ridge ($45). Pam said that this was her favourite Chardonnay and was a wine to which people tended to have strong positive or negative responses. In stark contrast to the previous wine, this was crisp, with pineapple and lemon flavours to the fore; definitely my style of Chardonnay. The first red wine that we tried was the 2016 California Old Vine Zinfandel. With a California designation, it is not clear from where in the state the grapes for this wine had been sourced. The nose was a balance of leather and raspberry jam. Taking a taste, I was pleasantly surprised to find that the jam in the bouquet was not present in the mouth; where raspberry fruit was balanced by a distinct acidity resulted in a smooth, subtle Zinfandel. This bottle sells for $45. 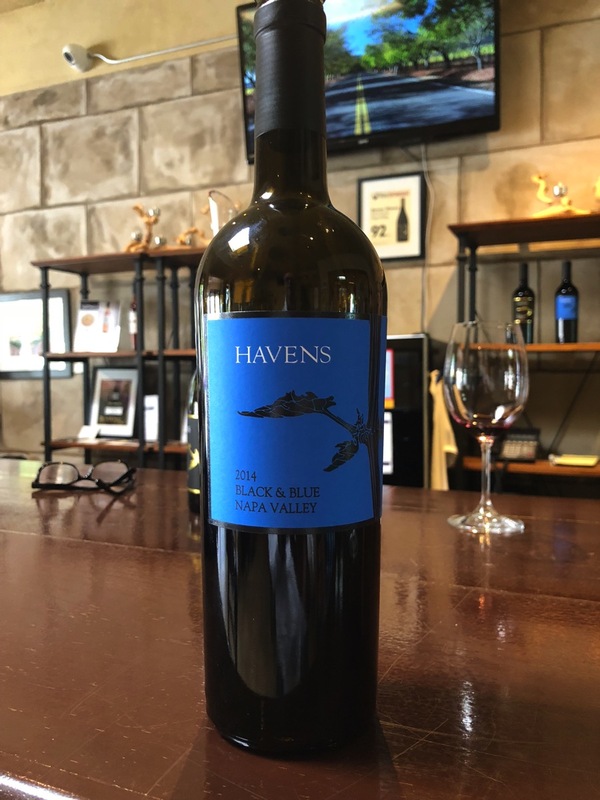 Next up was the $55 2014 Havens Syrah. The fruit for this wine was all sourced from Napa Valley. The nose was pure Syrah: raspberry, cocoa, leather, but perhaps a little too much of a smoked meat smell. The wine was bold, no surprise there, with delightful plum, red currants, and black tea tannins. The resulting wine was a good, well-balanced example of a California Syrah. Our third red was also on the Havens label. Called Black & Blue, this blend is 78% Syrah and 22% Cabernet Sauvignon. Blending these two grapes is common in Australia. However, I do not recall drinking this pairing of grapes in a US wine before. The wine was extremely dark in colour; almost ink black. The intense nose was of blackberry, leather, raspberry, with a floral backdrop. Gary identified the floral aroma as confederate jasmine; a Southern name for Trachelospermum jasminoides, known in California as star jasmine. Taking a taste, dark fruits were layered with leather in a full-bodied, yet soft, wine. Pam said that it paired well with Kobe Beef BBQ. The wine sells for $65 a bottle. 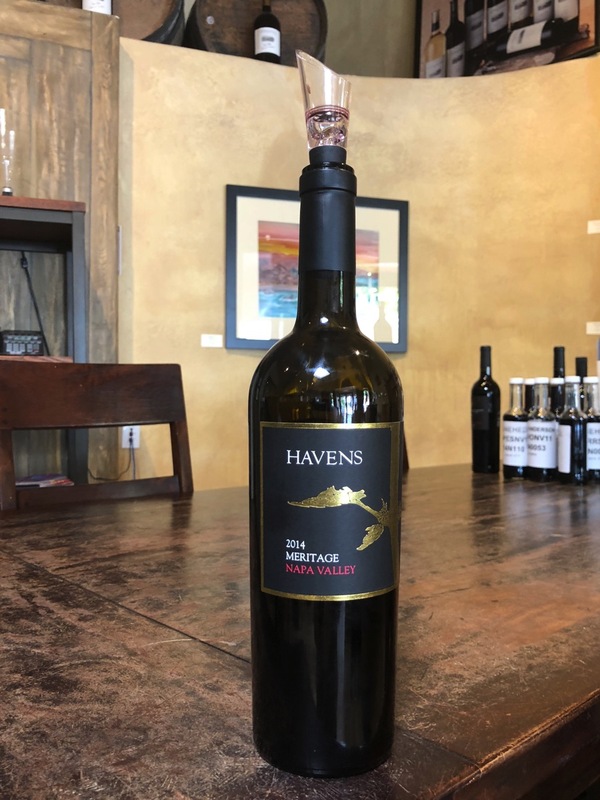 The next red was the 2014 Havens Meritage ($55). This vintage is 60% Merlot, 20% Cabernet Sauvignon, and 20% Malbec. The nose was rich and intense, one of those that delays your first sip as you enjoy a bouquet that promises so much. There were aromas of raspberry, stone, leather, and tobacco. When I finally took a sip, the taste reflected the nose; dark fruit and sour cherry balanced with earthy flavours. A good wine, but one overshadowed by the previous one. Meritage is a name created by Napa and Sonoma winemakers to indicate that the wine is a blend of two or more grapes of the varieties associated with Bordeaux. This allows wine-drinkers to recognize that the wine is a Bordeaux blend, without infringing on the legally protected name of that region in France. The name is a portmanteau of the words merit and heritage. Pam admitted to the same error that I made for many years; assuming that the wine’s name was pronounced as if it was a French word; merry-taj, whilst the correct pronunciation rhymes with heritage. The 2012 Bourriquout is a 60/40 blend of Merlot and Cab Franc. The nose was floral and earthy, with very little fruit. Taking a sip I was surprised by how out of sync the tastes were with the nose; sweet cherry and, in the finish, overly sweet raspberry dominated. For the first time in this tasting, I found a wine that was out of balance. 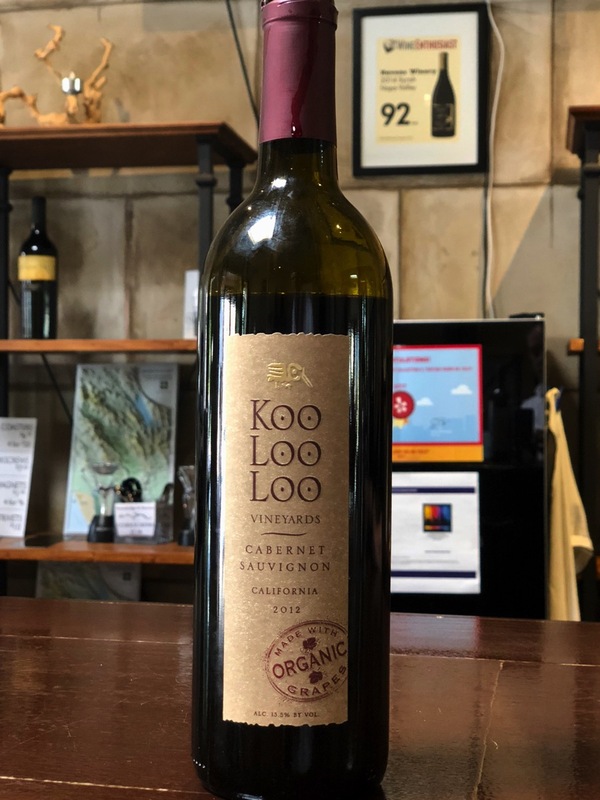 Pam next produced the Koo Loo Lo Cabernet Sauvignon. This bottle came with the warning that it was not to everyone’s taste. Unusually for a host in a winery or tasting room, Pam admitted that it was not to her taste. The name means bird in the language of the Maidu tribe who lived in the Sierra Nevadas and Sutter Buttes. It is in this latter area, a set of volcanic domes close to Yuba City, that the Koo Loo Loo vineyard is located. The wine’s nose of medium intensity offered aromas of cherry and leather. The overwhelming impression when I took a sip was of dirty earth over which someone had squeezed raspberry. The wine’s vintage was 2012, but the tannins were very intense, drying out the mouth and stripping any hint of fruit from the finish. This was an interesting wine, but not one that I would drink for pleasure. The final red perfectly encapsulated the concept of finishing on a high. 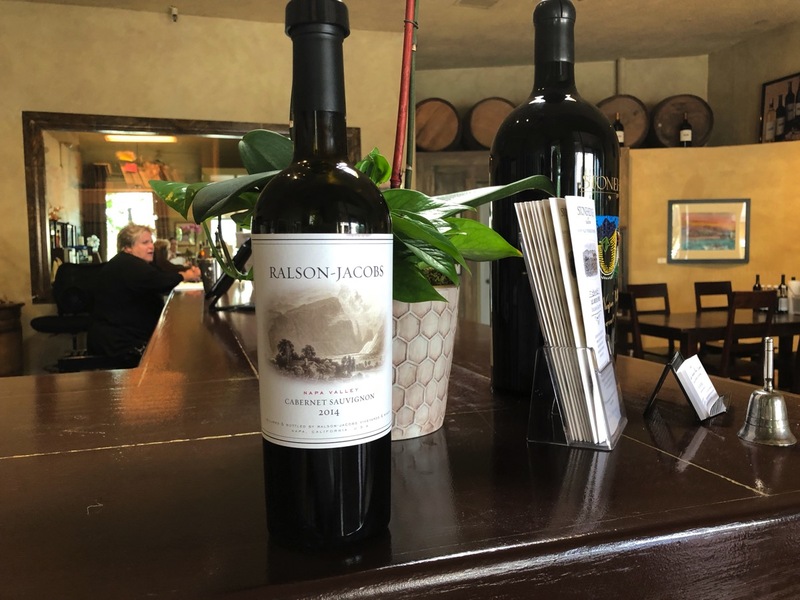 The $75 2014 Ralson-Jacobs; a Napa Valley Cabernet Sauvignon. The nose was an intense fruit blast with redcurrant and cassis. The tannins were softened by rich fruity flavours of raspberry and blackberry. An excellent example of how lush a Napa Cab can be. 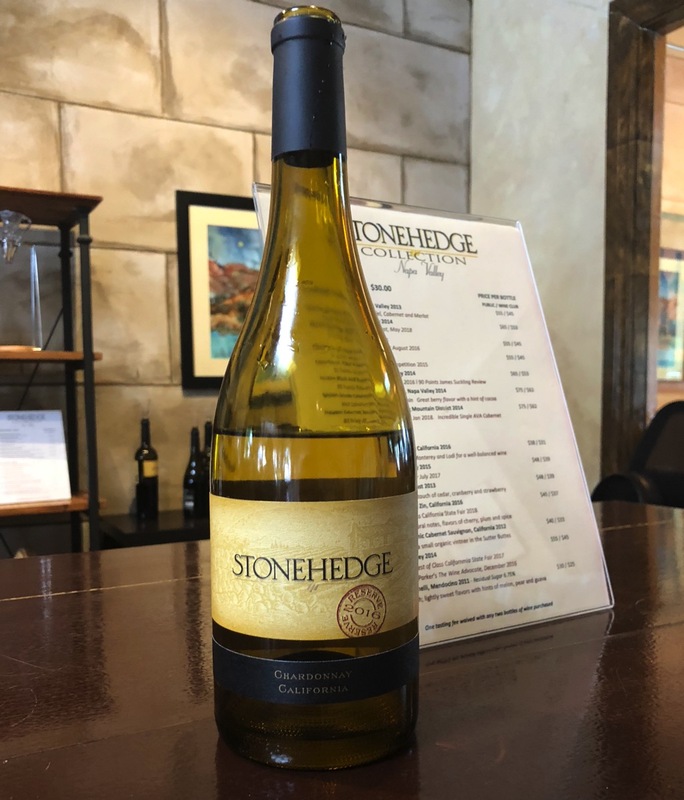 We finished with a dessert wine; the Stonehedge Late Harvest Chardonnay. This is not a varietal that I had seen used to make this type of wine before. The result made me wonder why it is not more common. The nose was of honey, almond, and apricot. It tasted like liquid honey, with a very nutty dimension helping to prevent the sweetness from being cloying. The variety of wines on offer at Stonehedge and the exuberance displayed by Pam made this an enjoyable tasting. It had been our plan to visit a couple of tasting rooms on this evening, but a thoroughly enjoyable two and a half hours of conversation, tasting and then drinking meant that this our only stop. To be honest, I suspect a second place would have felt like a disappointment. Amber comments: Yeh, maybe next time you will take me with you! I have passed this tasting room twice in the past month but have not visited. I will add to my list for my next trip. Thank you. All I know is Gary came home with three bottles of wine and said he had a blast. I can see why now.